Maintaining the theme of the past few weeks – some rather unusual weather for this time of year. We’ll hover around an average temperature of 60 degrees, almost the middle of December. Even the lows will not be that low: averaging 45 degrees in the morning and overnight. Enjoy it while you can, because you know what’s coming! The great news is that it makes this the perfect weekend to hit the road, grab your Christmas Tree, or perhaps do a little Christmas shopping. Join the community and spread holiday cheer at the annual neighborhood group tree lighting. Loretta Bourque Park – Ruth Street and Salisbury Street , New Bedford. Both galleries will feature one of a kind and limited edition gifts. Ceramics, fiber, photographs, wood, toys and more. Holiday shop is open through Dec. 18. Hours are 1-5 p.m. Tuesday-Friday and 10 a.m.-2 p.m. Saturdays. (508) 748-1266. marionartcenter@verizon.net. Marion Art Center, 80 Pleasant Street, Marion. Non-juried art exhibit, Dec. 4-30. Reception, 5-8 p.m. Dec. 17. AHA! Night. Cherry & Webb Gallery, 139 S. Main St., Fall River. Come visit the Buzzards Bay Coalition’s restored Acushnet Sawmill on Saturday mornings in November and December. The Hawes Family Learning Center will be open from 9am-12pm. At 10am, join us for one of these hands-on family activities: Winter Wildlife Shelter Building. 32 Mill Road, Acushnet. Non-profit and church groups have booths to sell holiday related items, baked goods, holiday greens, and more. There are raffles and silent auctions, face painting and craft making for the children. Some of the organizations with tables are: VFW Ladies Auxiliary, Whitfield-Manjiro Friendship Society, Church of the Good Shepherd, Fairhaven Improvement Association, Fairhaven Lions Club, Shining Tides Quilters, and others. Entertainment provided by Fairhaven music students. There will also be a drop boxes for new, unwrapped toys to be given to the area’s needy children and for the United Way food drive. Free. Handicap accessible. For more information, call 508-979-4085 or email FairhavenTours@aol.com. 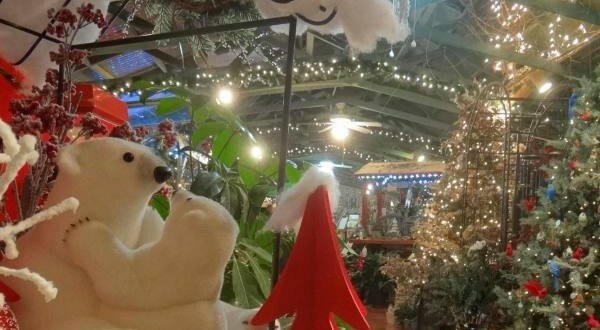 Holiday marketplaces and crafts fairs, luncheons and an old fashioned community sing-along are among the ways to enjoy the season of good cheer. For children, there are cookie decorating, craft making and face painting opportunities, and some chances for photographs with Santa or Father Christmas. More details can be had by clicking the event title. A full day of events from morning into early evening are scheduled in the historical town center. Starting at 10 a.m. on Dec. 12, Timothy Wade, local sand and ice sculptor and painter, will give an ice carving demonstration on the patio outside the Art Center on the Pleasant Street side. Meanwhile, inside the Art Center, local pastel artist Kim Weineck will give a pastel painting demonstration. Visitors are invited to come and watch both artisans as they transform ice into sculpture and apply pastels to paper to create beautiful portraits and landscapes. The Marion Art Center is one of the stops on the Sippican Women’s Club House Tour and visitors are cordially invited to come inside and find that one of a kind gift that will be for sale in both galleries. In the Junior high school gymnasium, every second and fourth Saturday, running until spring. Old Rochester Regional High School, 135 Marion Road, Mattapoisett. Lunch and snacks, bake table, craft vendors, quilt raffle. Free Holiday concert by VOX A Cappella at 2 p.m. (508) 994-9686. First Unitarian Church, 71 8th Street, New Bedford. Spread some Christmas cheer by helping out some less fortunate kids! 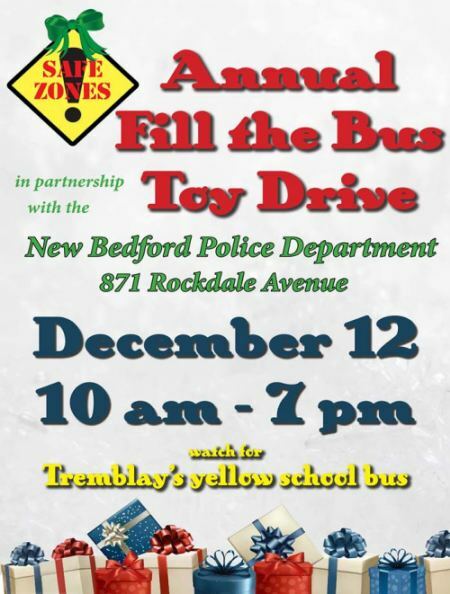 The New Bedford Police Department, Neighborhoods United of New Bedford, and Tremblay’s Bus Company would like to invite residents to participate in the 5th annual “Fill the Bus Toy Drive.” Unwrapped gifts can be donated to anyone of the four police stations. Also on December 12, 10AM- 7PM, gifts can be dropped off directly at Police Headquarters where a Tremblay’s bus will be. Gifts donated will be distributed accordingly to local school aged children from New Bedford. We thank you for your support! Police Station One: 572 Pleasant St. Police Station Two: 168 Cove St. Police Station Three: 781 Ashley Blvd. Police Headquarters: 871 Rockdale Ave. 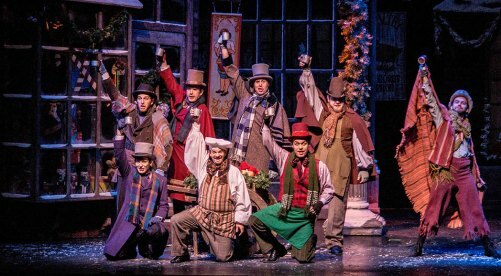 The beloved story of Ebenezer Scrooge is brought to life in stunning detail by the Nebraska Theatre Caravan. As the tradition grows with each year, The Z’s audience continues to celebrate this heart-warming and joyful production. Join our ever-growing Zeiterion family for a matinee or evening performance and experience the joy of the season! Location: Riverside Park on the corner of Belleville Avenue and Tallman Street. Join the Coalition and the Paskamansett Bird Club to look and listen for birds along the Shaw Farm Trail. We’ll walk along the trail into the Nasketucket Bay State Reservation. Binoculars will be available or you can bring your own. Please dress warmly and wear sturdy shoes or boots. Shaw Farm Trail, Shaw Road, Phoenix Bike Trail, Fairhaven. Catered breakfast, free pictures with Santa. 9-11:30 a.m. Nov. 29. $10 adults, $6 children. Under 3 free. Sponsored by the Rotary Club of New Bedford. (508) 789-3138. New Bedford YMCA, 25 Water St., New Bedford. 50 plus local vendors, holiday items, jewelry, Chinese auction, and more. Entertainment by The Showstoppers, 11 a.m.-1 p.m. Free admission and free door prize entries. (508) 717-8715. Gifts To Give, 1 Titleist Drive, Acushnet. 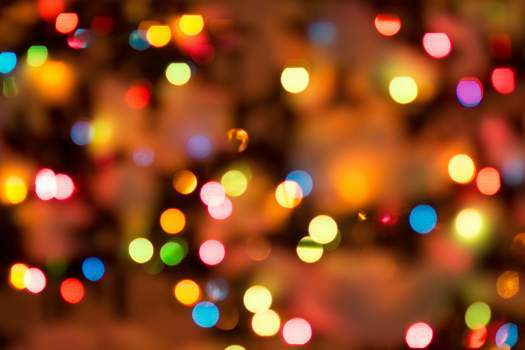 Don’t miss the Cove Street and Bullard Street tree lightings on Friday and Saturday! Want to sponsor this weekend guide? Contact info@newbedfordguide.com for more details.Visit www.boldmovesrealestate.com for more local events.This blog was posted on www.boldmovesrealestate.com on December 11, 2015.